Lignite can be successfully extracted from open-cast operations only if the area’s ground water level is lowered below the coal seam. This has a strong influence on the region’s water balance. 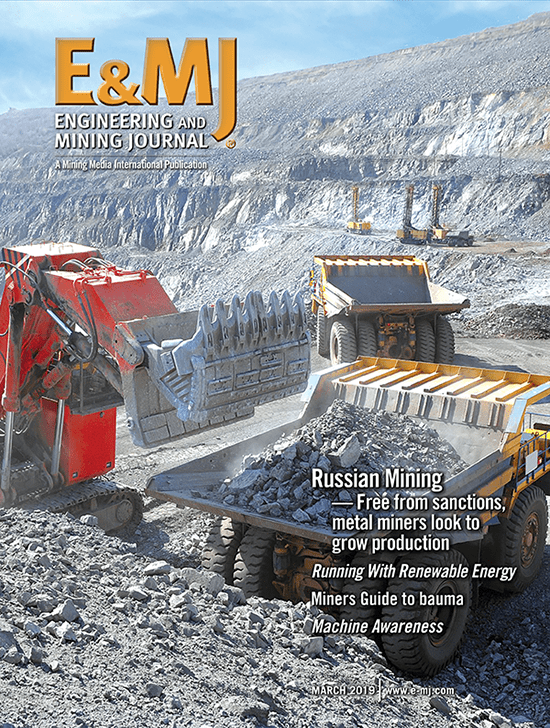 Depending on the chemical nature of the overburden, the ground water that often rises again to a higher level after the cessation of mining in the pit may become acidic due to pyrite weathering. Germany’s Federal Mining Act (BBergG) stipulates that operators carry out rehabilitation measures on the surfaces areas of former mines. This also applies to the lakes they produce. Thus, ground water remediation projects seek to balance-out the ground water deficit and neutralize the contents of any ensuing pit lake so that flora and fauna may be established. Lime is usually used in this process, but large quantities are generally needed to treat an entire body of water because only a low level of blending can be achieved using conventional methods. 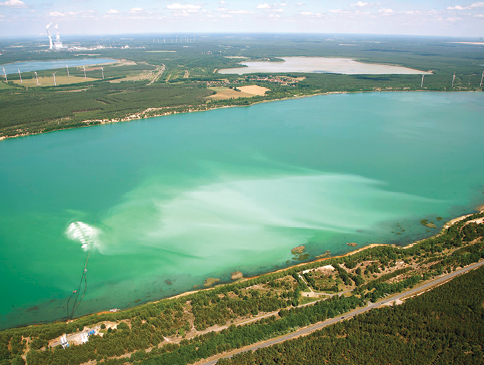 To overcome this obstacle, a German firm has developed what it calls the Underwater Nozzle Pipelines (UNP) method as an alternative: lime mixed with lake water is pumped from the nozzles of pipes floating in the lake, using the lake’s natural circulation pattern to thoroughly blend and distribute the suspension evenly throughout. The method was successfully demonstrated in a pilot project at Lake Scheibe, in the Lusatia region of eastern Germany. The lake contains approximately 110 million m3 of water. Before primary neutralization was achieved, it had an acid concentration of 381 million moles. This treatment plant on the shore of a lake in a German lignite mining district was built in two phases to carry out a successful lime-injection experiment to neutralize the acidic lake water. The lignite mining region of Lusatia alone has 36 pit lakes with an aggregate expanse of 146.8 million m2 and a water volume of 2.287 billion m3. Their pH values vary from 7.5 to an acidic 3, which in itself precludes the emergence of a functioning ecosystem. This prompted GMB GmbH, a mining services provider, to begin development of the UNP method in 2010, in partnership with Fels-Werke GmbH, Institut für Wasserwirtschaft, Ökologie und Siedlungsbau IWSÖ GmbH, the Kemmer/Harbauer GmbH Group and Linde Gas. The project group used the laboratories of the Brandenburg University of Technology Cottbus-Senftenberg (BTU). 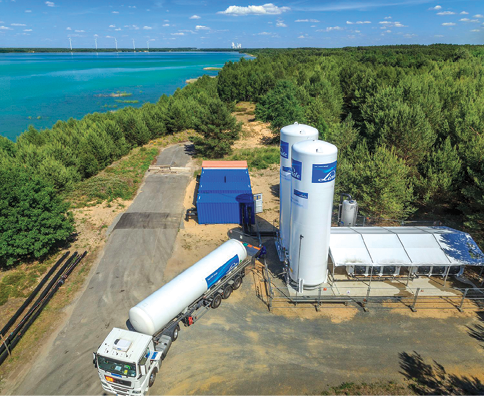 “GMB GmbH applied to carry out both a pilot and a demonstration project—initial neutralization and CO2 buffering,” said Eckhard Scholz, head of the Engineering Division at Lausitzer und Mitteldeutsche Bergbau-Verwaltungsgesellschaft mbH (LMBV). The LMBV is responsible for recultivation of the region’s lignite mining area. Among other measures, it uses pilot and demonstration projects to develop innovative technical solutions for water treatment, from their technical inception to a scale suitable for actual remediation measures. 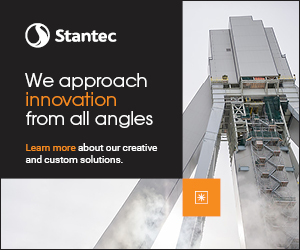 A fixed plant was built on the lake shore in early 2012 for the first stage of the project—initial neutralization. The plant’s purpose was to blend lake water with lime, on-site. Six pairs of nozzles were attached at 20-m intervals to a floating pipe located about 50 cm beneath the water surface during this stage. A 4% suspension consisting of 15,200 mt of slaked lime and 440,000 m3 of lake water was pumped into the lake at a velocity of 7.6 m/s and a flow rate of 260 m3/h, six days per week over a period of 16 weeks. A 4% suspension consisting of 15,200 mt of slaked lime mixed in lake water was pumped into the lake at a velocity of 7.6 m/s and a flow rate of 260 m3/h, six days per week over a period of 16 weeks. “The UNP method exploits the phases of lake circulation to ensure ideal blending with the lake water,” explained Dr. Michael Strzodka, head of the engineering office at GMB GmbH. “The lime is introduced to the epilimnion (upper layer of a stratified lake). But the waters in the lake possess different densities, which ensure that the lime is distributed throughout the lake during the phases of full circulation in spring or autumn. Distribution of the lime suspension is therefore entirely natural and does not require any external energy source. In this manner, the pH value was increased from 2.9 to 7. In June 2015, the plant was updated for a second stage, which involved the introduction of CO2 to the lake to induce hydrocarbonation. Here, the suspended CO2 was fed into the hypolimnion, or lower layer, via the lake bed while the forced inflow of lime remained directly beneath the surface of the water. The process initially utilized the lake’s layering phase that occurs in summer and winter to add the two suspensions to the water in separate layers. In the subsequent full-circulation phase, an entirely natural blending took place, thus allowing the lime to react with the CO2. “We would have needed a massive facility to produce hydrocarbonation outside the lake. Maintenance and operation alone would have been extremely costly. In contrast, our new method of using full circulation of the lake is practically free and very efficient. The lake itself is used as a fully equipped reaction chamber,” said Strzodka. With the simultaneous treatment of the lake with lime and CO2, a buffer is created and the water body requires far less additional treatment, leading to significantly lower costs. The treatment is complete as soon as the biological processes themselves restore the natural balance to the lake. This aerial view shows the pattern of distribution of a lime suspension from a set of nozzles floating just under the water’s surface. The initial treatment raised the pH of the lake water from 2.9 to 7. Scholz said, “The GSD system proved extremely effective during initial neutralization of Lake Scheibe and is therefore outstanding value for money. 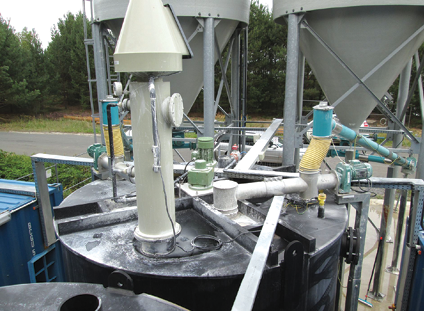 Also, the project management team at GMB GmbH, the scientific advisers and the system engineers always managed to promptly find remedies to technical issues that arose during the operational phase.” The method is particularly suitable for expansive lakes with significant acid inflow, as large volumes can be treated in a short period. In addition to building another UNP system at Lake Bernstein, GMB GmbH is already looking for additional applications. “As things stand, the system configuration and operation are specifically designed for Lake Scheibe. So we are currently reviewing what standardization of the system components might look like,” said Strzodka. Defining standard sizes for the floating pipes, pumps, the mixer and the nozzles would allow the method to be used to treat smaller ponds.